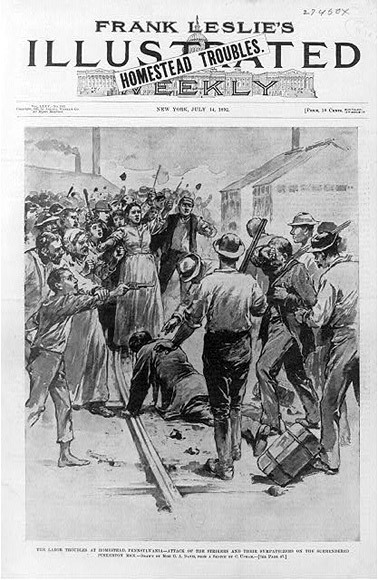 Strikes have played a significant role in the economic, political, and social life of the United States throughout its history. From strikes by shoemakers, printers, bakers, and other artisans in the era of the Revolution through the bitter airline strikes two centuries later, workers repeatedly tried to defend or improve their living and working conditions by collectively refusing to work until specific demands were met. Since the early 1880s, when reliable statistics were first compiled, American workers have struck with a frequency roughly equal to that of their peers in Europe. Strikes in the United States, however, have tended to last longer than elsewhere, with a mean duration between 1881 and 1974 of twenty days. Accordingly, the total number of workdays lost in strikes proportionate to the size of the work force has been higher in the United States than almost anywhere else in the world. The United States also has had the bloodiest labor history of any industrial nation. The first strike fatalities were two New York tailors, killed in 1850 by police dispersing a crowd of strikers. Since then, according to one estimate, well over seven hundred people - mostly strikers - have died in strike-related violence, and the total may be much higher. Some died in famous incidents, such as the 1913 Ludlow Massacre, when National Guardsmen attacked a tent colony of striking Colorado miners, or the 1937 Memorial Day Massacre, when ten supporters of a steel strike were killed by Chicago police. Most, however, died in little-noted confrontations with company guards, private detectives, scabs, or police. Although wage disputes have been the single most common cause of strikes, workers have walked off their jobs for many reasons, including efforts to win union recognition, shorten the workday, gain or defend control over the work process, improve working conditions, and protest the disciplining of unionists. Strikes have been called to exclude nonwhites or women from jobs and, more rarely, to protest racial discrimination. Unlike elsewhere, political strikes over non-work-related issues have been uncommon. Strikes have played a major role in both the rise and fall of unions (though many have occurred without union involvement). Often strikes have stimulated the formation of new unions or union federations. The first citywide labor federations, formed in the 1820s and 1830s, grew out of strikes by artisans seeking to shorten their workday. Over a century later, the Congress of Industrial Organizations (CIO) was indirectly an outgrowth of a wave of strikes by industrial workers. Conversely, failed strikes have destroyed many unions. The American Railway Union, for example, was unable to survive the defeat of its 1894 strike against the Pullman Car Company. More recently, the mass firing of striking air traffic controllers by the Reagan administration led to the demise of the Professional Air Traffic Controllers Organization. ---About 24 million immigrants. 60% from Southern and Eastern Europe, about 25% Northern Europe (Germany, Ireland, Scandinavia), 15% other (Asian Mexican, etc). Approximately 35,000 workers a year were killed annually in work-related accidents from 1880 to 1900. Injured workers totaled another 536,000. 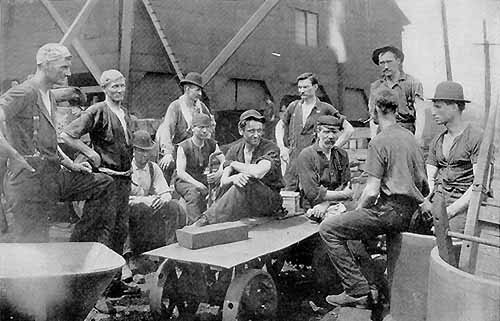 Between 1905 and 1920, there were an average of 2000 fatal accidents in the coal mining industry every year. The unemployment rate before World War I rarely fell below 8% for full-time jobs. Underemployed workers probably counted for about 25% of the work force. A minority of urban workers had full-time year-round work. Before 1920 about one in every four non-farm children under fourteen worked full-time. Before the 1930s less than half of Americans received more than a grade school education. In the era of dramatic industrialization following the Civil War, the most powerful of the big business corporations were the railroad companies. In order to protect their profits during the economic depression that had begun in 1873, they companies had reduced the pay of railroad workers by ten percent. In 1877 they announced another ten percent reduction in the workers' pay, and also that railroad employees would be required to use company hotels when away from home, which meant a further reduction in real wages. On top of this, they decided to reduce the work-force - which meant unemployment for some and intensified labor for those remaining. On July 16, a spontaneous strike erupted in Martinsburg, West Virginia and quickly spread to cities from St. Louis and Chicago to New York and Baltimore - hitting Pittsburgh on July 19. To "keep the peace" and break the strike, state militia units from Philadelphia were ordered to Pittsburgh. (Militia units from Pittsburgh were deemed unreliable because they sympathized with the strikers.) On July 21, six hundred troops arrived from Philadelphia. Led by Superintendent Robert Pitcairn of the Pennsylvania Railroad and a posse of constables with arrest warrants for the strike leaders, they found themselves confronted by crowds of men, women and children. The crowds, loudly protesting the troops' presence and expressing support for the strikers, sought to prevent military action. The militiamen responded with a bayonet charge that resulted in injuries and provoked a hail of rocks from some sections of those assembled. The troops then opened fire on the unarmed men, women, and children, scattering them - and leaving at least twenty dead (including one woman and three small children) and twenty-nine wounded. Workers from other cities and towns in Pennsylvania joined in the strikes or in rallies and meetings supporting the strike. General strikes, mass demonstrations, and sometimes violent confrontations rocked cities in many other states as well, though none exceeded the violence of the Pittsburgh battles. "The great strike--The Sixth Maryland Regiment fighting its way through Baltimore," Harper's Weekly, August 11, 1877. 4 May -- 13 - 1400 participated in a meeting at Haymarket Square, called by anarchist August Spies, Knights of Labor, and many socialists unions and international anarchists, protesting the use of police force to disperse strikers. At 10 P.M. when 180 police arrived to order the crowd out, a bomb thrown into their midst killed 7, and wounded at least 60. It was assumed that an anarchist threw the bomb and raids were conducted on all known radical groups, including trade union leaders. Judge Joseph E. Gary presided over the trial of Samuel Fielden, speaking when the bomb was thrown, August Spies, Albert Parsons, Michael Schwab, Adoph fisher, George Engel, and Oscar Neebe, who were charged with conspiring to kill. Although no evidence linked specific persons to the incident, the prosecution focused on their radical beliefs and advocacy of violence to achieve goals. This political trial resulted in 7 convictions (the 8th defendant hung himself). be murderers or accessories before the fact As a result, an anti-radical and anti-union feeling swept the American public mind. 5,000 steelworkers struck Andrew Carnegie's steel plant near Pittsburg PA.
A pitched battle erupted between the strikers and 300 Pinkertons hired by plant manager Henry Clay Frick who had been hired to protect the strikebreakers. Seven guards were killed. George Pullman , Pullman Palace Car Co., had established a model town for his workers near Chicago which promoted a clean healthy atmosphere, giving Pullman a public image as a benevolent, paternalistic industrial captain. The panic of 1893, worse in US history at that time, caused a wage cut by 1/3, but no lower rent on company housing nor price reduction at company stores. 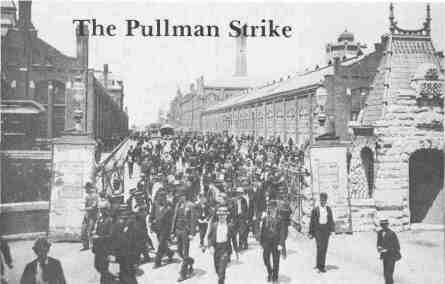 When Pullman fired a suspected union organizer, a strike grew ugly by 1894. Eugene Debs , leader of the American Railway Union , aided strikers by refusing to handle railroads using Pullman cars, encouraging other unions to join. The strike was ended by a court injunction, based on the Sherman Anti-Trust Act, after which President Cleveland sent in 10,000 federal troops (because of "interference" with the US mail), who along with 2,000 state troops smashed the ARU. the short distance to their nearby Pullman-owned homes and apartments.